Heat oven to 350°F. Spray bottom and sides of 13x9-inch (3-quart) glass baking dish with cooking spray. In large bowl, stir cookie mix and melted butter until crumbly; set aside. In another large bowl, toss apples, 1/2 cup of the caramel topping and the cinnamon. Spoon into baking dish; sprinkle with cookie mixture. 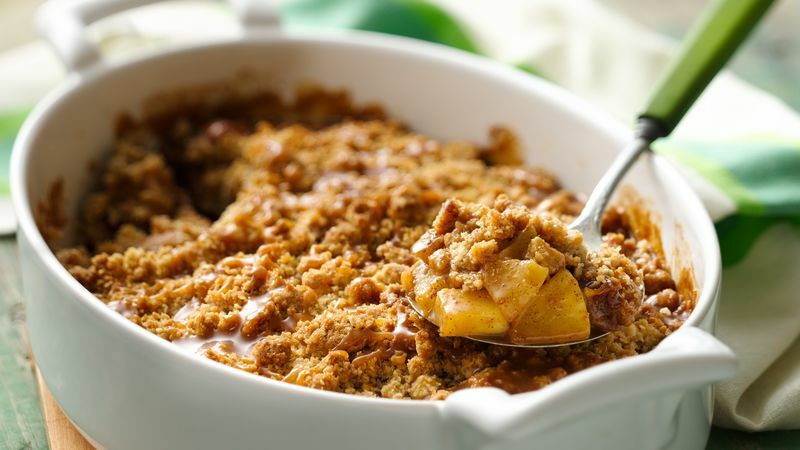 Bake 35 to 40 minutes or until topping is golden brown and apples are tender. In small microwavable dish, microwave remaining 1/2 cup caramel topping uncovered on High 20 seconds. Drizzle over crisp. Serve warm. For more fiber and color, leave the peel on the apples. Try to cut all of the apples in this recipe into slices of the same thickness, so they’ll cook evenly. To test for doneness, simply poke the tip of a sharp knife into an apple, and you’ll be able to feel if it’s tender.